The Conrad-Holland family has been the subject of several posts on this site. Initially my curiosity about the Conrads was sparked by the family’s burial plot in Danville’s Green Hill Cemetery. I may never know who designed or chose the monuments within the tree-themed square nor may I ever find out the identities of everyone who is buried within it, but I’ve been able to piece together various details of their lives through historical newspapers and records. There are at least two very weathered markers in the plot that have no names on them and have been propped up against other markers or the stone curbing. Initially I believed that Charles Conrad’s daughter Lucile was buried with her parents, several of her siblings, and other relatives even though there was no specific marker for her. 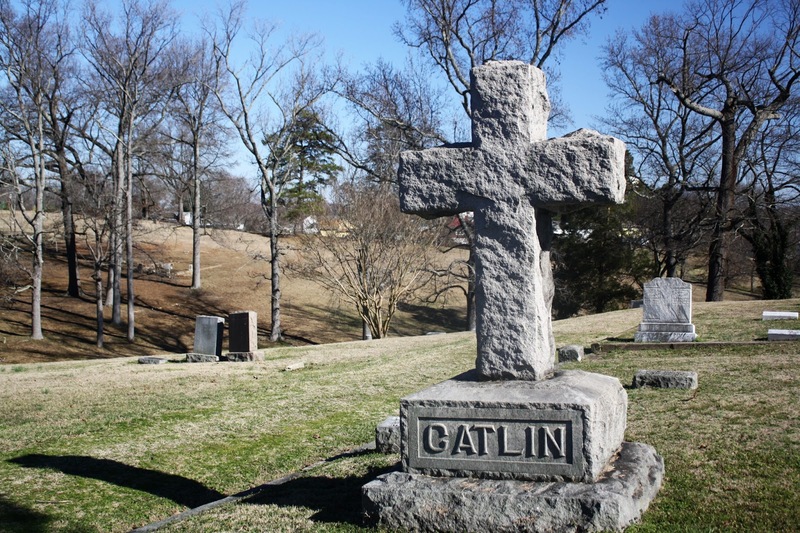 I knew that she’d married William Greenwood Catlin, and one day when I was at Green Hill I noticed a large stone cross marking a family square which read, “Catlin” on the main road, on the other side of the graveyard from the Conrad-Holland square. Aside from the large cross, the other markers were all of the same size and shape, with only names and birth and death years on them. This was a vast departure from the highly decorated markers in the Conrad square. Lucile’s grave was among the others in this plot, giving me a piece of information that I didn’t already have: her death year. Lucile managed to escape the fate of her mother and siblings Hazel and Louise by living long enough to celebrate her 85th birthday. I began to look for more details about Lucile, who was born into a wealthy Southern family but had seen her fair share of tragedy in her early years. At age 10, her mother died shortly after giving birth to her youngest sibling, Hazel. Hazel would die about a month after her mother. Lucile’s father met death unexpectedly in some sort of “incident” on the railroad in 1893, reportedly leaving behind at least $80,000 in life insurance. Lucile and her four siblings lived with her maternal uncle, banker Charles L. Holland, and his wife Lizzie, on Holbrook Avenue after the death of Mr. Conrad. 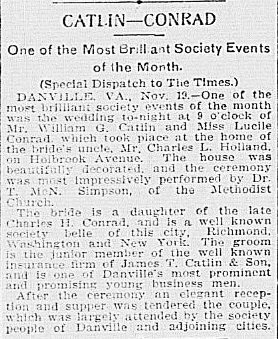 Lucile, described as a “society belle,” married William G. Catlin in November 1902, an event held at the Holbrook Avenue residence. The article about the wedding tells us that William was a junior partner in his father’s insurance company, hinting that she had married into a family whose social standing was near her own. 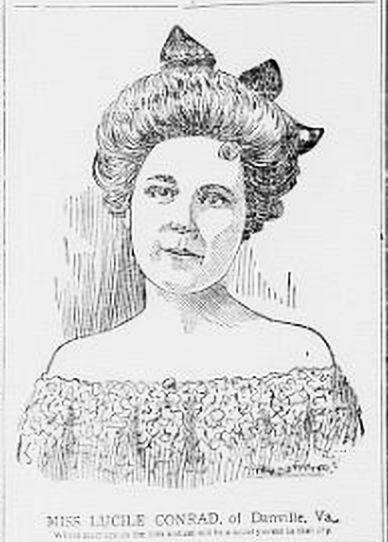 It seemed like life was going relatively smoothly for Lucile after a rocky childhood, but her lucky streak ended in February 1905. William, who was 26 years old at that time, had gone on a duck hunting expedition in South Carolina. 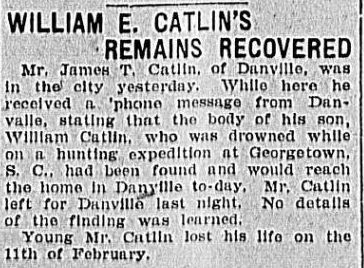 It was possibly the sort of trip he’d made many times before, but this time when he departed Danville he didn’t know that he would never make it home to his family. William and a guide were on a boat which turned over on February 2 and while the guide’s body was recovered, as of February 19 William was still missing. There was little to no hope that he would be found alive. Understandably, Lucile was “prostrated” about the loss of her husband in such a horrific and unexpected manner. On March 3 word came that William’s body had been discovered and by the end of the next day he had been buried in Green Hill Cemetery. There was no information on what kind of memorial service, if any, was held after his body was recovered. It’s likely that the family had already started the mourning process in mid-February when they learned of the accident and a service was held then. There is little to be found in the society pages about Lucile after her husband’s death. I can only speculate that she largely dropped out of the public eye, deeply depressed by the death of her beloved husband and living with her in-laws, while other members of her family and her friends married and started families of their own. Or perhaps the details of her life just weren’t as publicized as they had been when she was younger. As of 1920 Lucile, aged 41, was living with the Catlins at 224 West Main Street.1 Also in the home were William’s brother James, his wife, and their two children. Lucile may have had a close relationship with her niece and nephew since she didn’t have any children of her own. When Lucile moved out of that home isn’t clear. She doesn’t appear in the 1921 city directory but that doesn’t necessarily mean that she wasn’t still there. In 1926 she received an undisclosed amount of money and/or assets from the will of William’s father, James T. Catlin Senior.2 William’s mother had died three years earlier in 1923. If Lucile hadn’t moved out of their home by then, James’ death might have been the catalyst for her doing so. 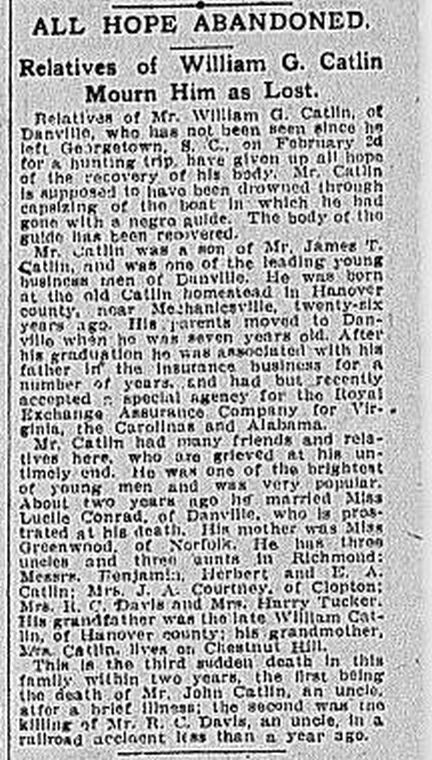 There is a Lucile Catlin living in Asheville, NC in the early 1930s who came to Danville on occasion to visit. 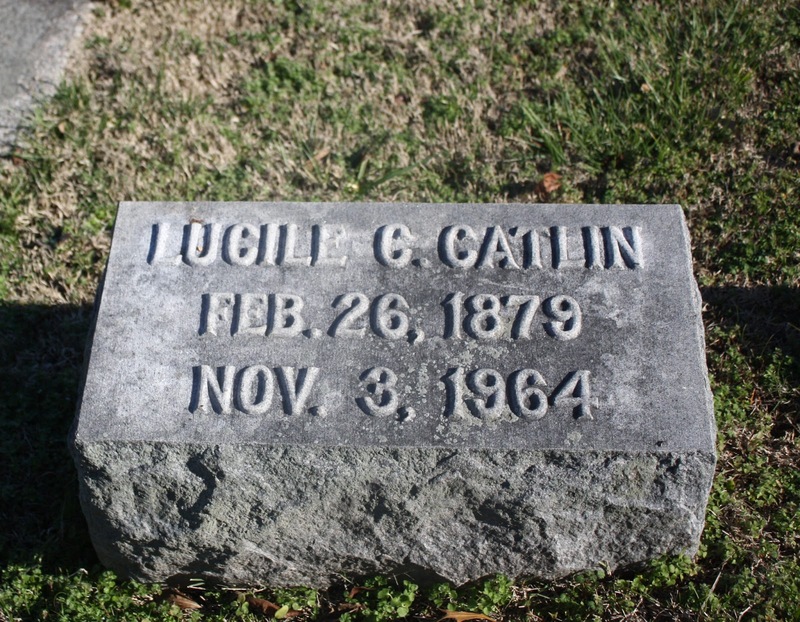 In April 1933 this Lucile Catlin was a guest at the home of Mrs. H.L. Boatwright.3 I believe this is the same Lucile due to the unique spelling of her name and because the Boatwrights were another prominent Danville family. It would make sense that Lucile ran in the same social circle with them. 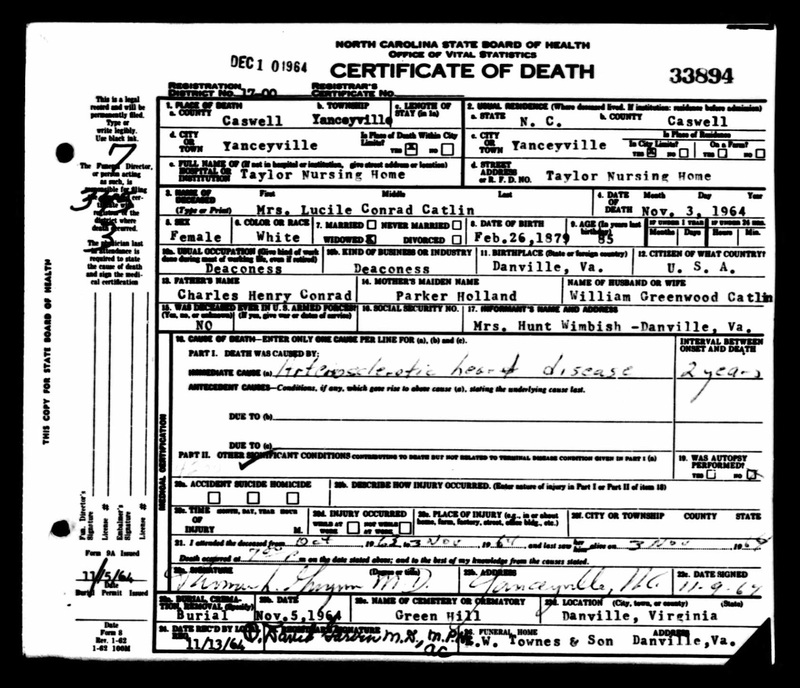 The next piece of information is Lucile’s death certificate from 1964. According to that, she had been a “deaconess” and was the widow of William Catlin, a clue that she never remarried. Because she had no children, her next-of-kin was her sister, Lizzie Hunt Wimbush. She died at Yanceyville, North Carolina’s Taylor Nursing Home of artereosclerotic heart disease following an illness that had lasted two years.